Today I'm delighted to welcome Sally Murphy as guest blogger at Spinning Pearls. Sally's on tour with her brand new verse novel, the cleverly-titled "Pearl Verses the World". Here's what Sally has to say. Thanks for having me here, Sally. Today is a special day for me, because it marks the release of my first verse novel, Pearl Verses the World, a verse novel aimed at primary aged children, about a girl dealing with isolation at school, and with her grandma’s illness at home. As someone who loves to laugh, I didn’t expect to ever sit down and write a book dealing with loneliness, death and grief. But one night as I was getting into bed a poem came to me, speaking of loneliness and isolation. I wrote it down, and left it alone. Soon afterwards, other poems came to me, and I realised I had a story about a girl who was very sad and very lonely. There was a story which needed to be told and I needed to sit down and be the teller. Pearl’s story was easy to write in many ways. It was almost as if Pearl was channelling through me – she told me her tale, and whenever I felt that I didn’t know what was going to happen next, I stopped writing and waited for it to come to me. And come to me it did; often when I was in the shower, or lying in bed, or doing something totally removed from writing. I gradually worked out why Pearl was sad, and why she felt lonely. She was watching her beloved grandmother fade away, and her grief had forced her apart from her classmates. Having said that, Pearl’s story was in other ways terribly hard to write. When I wrote the scenes dealing with Granny’s death I experienced grief. A grief so real that I had to stop writing, curl into a ball and howl. Even long into the editing process I still cried. I also had to consider whether the book was too sad for child readers. Did I want children to cry as I had cried? The eventual answer was yes, I did need to share this story with children. They may cry when they read it – but hopefully they will also smile and even, perhaps, laugh out loud. Above all, I hope they will see that although they may experience loss or grief in their lives, life does go on and there is always hope. I also hope they will know it is okay to grieve, in their own way and in their own time. I hope that readers – young and old - will smile with Pearl. Thanks, Sally! I feel it in my bones that Pearl Verses the World is going to storm into the world and take it over... by storm. And I'm sure many writers who read Sally's account of the writing of "Pearl" are nodding with sympathy. Some books are just books, but some books, authors LIVE, even if they have never experienced the situations themselves. Today I welcome Sally Murphy to Spinning Pearls. 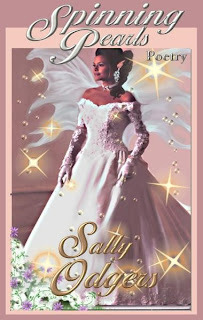 Sally is a children’s author and poet, with 28 books in print and more in production. She also runs a book review site which reviews only Australian books. I have sent out an open invitation to authors and readers to nominate their favourite ever children's books. This is Sally's list. Dragonkeeper Series, by Carole Wilkinson - fantasy as it should be for children – beautifully crafted, and a sense that it is true. The Naming of Tishkin Silk, by Glenda Millard - a tear jerker. I loved the sequels as well. Pearl Verses the World, by Sally Murphy (that’s me) – my favourite one of my own works to date. I'm delighted to announce my two poetry books, Fernseed for Fairysight and Spinning Pearls are now available in paperback. You can buy them, if you're so inclined, from Amazon. If you prefer the PDF versions, buy directly from www.eternalpress.ca or from Fictionwise.